Joyous, potentially litigious news, everybody! 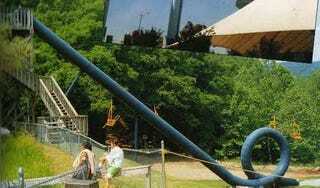 New Jersey's Action Park, home of the looming carcass of a decades-old vertical looping water slide that was as injurious as it was mysterious, is getting a new attraction. Above, and coming in 2016, is the SkyCaliber. It seems like it works safely, which means it has no place at the Action Park I remember. Our friends at Toyland have a look at the SkyCaliber, which is still in the testing stages but at least seems cognizant of the laws of physics. 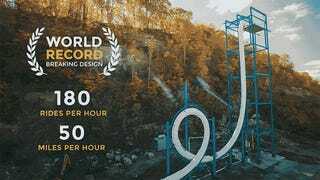 It will be the first true vertical looping slide since Action Park's Cannonball Loop—the common "AquaLoop" configuration is actually canted at a 45-degree angle. Below is our story on Cannonball Loop, which was open for all of one month in the summer of 1985 before becoming the stuff of urban legend.